Can a wicked boy be rehabilitated? What would cause a young boy to murder his mother and can there be any redemption for him after committing such an act? 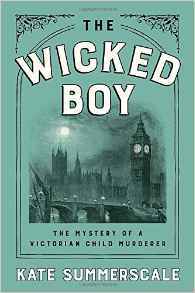 Those questions are central to The Wicked Boy, a novel which covers a true crime that happened in Victorian London in 1895. Thirteen year old Robert Coombes and his eleven year old brother Nattie were living in London with their parents as the 19th century was drawing to a close. Their father, also named Robert, worked on merchant ships that made transatlantic crossings. He was frequently away from home for long periods, leaving the boys in the care of their mother Emily. During one of their father's job-related absences, friends and family members began to notice that they hadn't seen Emily for a while. The boys said they had gotten word that a rich relative had died, and that their mother had gone to Liverpool to check on their inheritance. In the meantime, John Fox, a somewhat simple man who worked at the same shipping company as their father, was staying with them. The boys were seen spending lots of money (attending cricket matches, among other things), having Mr. Fox pawn belongings, and even sending letters to the shipping company attempting to get an advance on their father's wages while their mother remained absent. Eventually, relatives insisted on entering the house and the body of Emily Coombes was discovered upstairs in bed. She had been stabbed repeatedly. The boys and John Fox were quickly arrested as the police attempted to sort out who was responsible for the crime. As the investigation continued, it emerged that Robert was the one who wielded the knife against his mother. What could have caused him to behave in such a way? The press was quick to blame his love of "penny dreadfuls," cheap books that featured adventurous heroes and exotic locations. Because of his young age and somewhat more enlightened times (compared to how justice had been meted out in earlier times in England), the boy wasn't hanged. The rest of the book deals with his punishment for the crime and the events that happened later in his life. The most startling aspect of the book to me was a quote from an article in the newspaper the Pall Mall Gazette, advocating the practice of killing morally defective children at birth (were we only able to detect such a thing!). The quote reads, "It would be well if we could choke such moral abortions at birth, as we now choke physical ones." That would seem to imply that it was entirely legal in Victorian England to euthanize babies with physical defects at birth. That's the first I've ever heard of this practice, and the author didn't elaborate on it at all. A footnote explaining the historical context would have been appreciated. I enjoyed reading about how the young boy was treated in the press and legal system of the day. It was really interesting also to read about how the author was able to tease out the details of Robert's later life and the methods she employed to do so.